1) Rhodes was frustrated the day of Obama's 2016 State of the Union because the story about Iran kidnapping 10 American sailors couldn't be hidden longer from the public. For much of the past five weeks, Rhodes has been channeling the president’s consciousness into what was imagined as an optimistic, forward-looking final State of the Union. Now, from the flat screens, a challenge to that narrative arises: Iran has seized two small boats containing 10 American sailors. Rhodes found out about the Iranian action earlier that morning but was trying to keep it out of the news until after the president’s speech. "They can’t keep a secret for two hours," Rhodes says, with a tone of mild exasperation at the break in message discipline. Standing in his front office before the State of the Union, Rhodes quickly does the political math on the breaking Iran story. "Now they’ll show scary pictures of people praying to the supreme leader," he predicts, looking at the screen. Three beats more, and his brain has spun a story line to stanch the bleeding. He turns to Price. "We’re resolving this, because we have relationships," he says. The sailors were set free the next day, unharmed. Secretary of State John Kerry later praised Iran for making sure the U.S. sailors were "well taken care of" and thanked its authorities for their "cooperation and quick response." Iran state television released embarrassing photos of the sailors with their hands on their heads for propaganda purposes, and the navy commanders responsible for the capture were later awarded medals by the Iranian Supreme Leader Ayatollah Ali Khamenei. 2) Apparently, Rhodes' name rarely appears in news articles because he is "invisible" and "not an egotist." It has been rare to find Ben Rhodes’s name in news stories about the large events of the past seven years, unless you are looking for the quotation from an unnamed senior official in Paragraph 9. He is invisible because he is not an egotist, and because he is devoted to the president. But once you are attuned to the distinctive qualities of Rhodes’s voice—which is often laced with aggressive contempt for anyone or anything that stands in the president’s way—you can hear him everywhere. Rhodes constantly appears with on-the-record quotes in news reports, actually. A Nexis search reveals his name has appeared 2,489 times in major publications since the beginning of the Obama administration, and he also appears on cable and network television shows as a spokesman for the White House. The idea that he is not an egotist also seems belied by the multiple comparisons in the article of him to Holden Caulfield, the angsty, judgmental teenage protagonist of The Catcher in the Rye. 3) Rhodes, who is not an egotist, is so tight with the president that he says he doesn't know where he begins and Obama ends. Part of what accounts for Rhodes’s influence is his "mind meld" with the president. Nearly everyone I spoke to about Rhodes used the phrase "mind meld" verbatim, some with casual assurance and others in the hushed tones that are usually reserved for special insights. He doesn’t think for the president, but he knows what the president is thinking, which is a source of tremendous power. One day, when Rhodes and I were sitting in his boiler-room office, he confessed, with a touch of bafflement, "I don’t know anymore where I begin and Obama ends." 4) Like his boss, Rhodes smoked a lot of pot in high school. Rhodes’s mother and father are not interested in talking about Rhodes. Neither is his older brother, David, who is president of CBS News, an organization that recently revived the effort to declassify the contents of the redacted 28 pages of the Sept. 11 report on the eve of Obama’s visit to Saudi Arabia, on which Rhodes, as usual, accompanied the president. The brothers are close, but they often go months without seeing each other. "He was like the kid who carried the briefcase to school," Ben says of his brother, who worked at Fox News and Bloomberg before moving to CBS. "I actually didn’t do that great in high school because I was drinking and smoking pot and hanging out in Central Park." 5) Rhodes pushed a fictional narrative that Obama saw an opportunity to make a nuclear deal with Iran beginning in 2013, when elections brought "moderates" into power. The way in which most Americans have heard the story of the Iran deal presented — that the Obama administration began seriously engaging with Iranian officials in 2013 in order to take advantage of a new political reality in Iran, which came about because of elections that brought moderates to power in that country — was largely manufactured for the purpose for selling the deal. Even where the particulars of that story are true, the implications that readers and viewers are encouraged to take away from those particulars are often misleading or false. 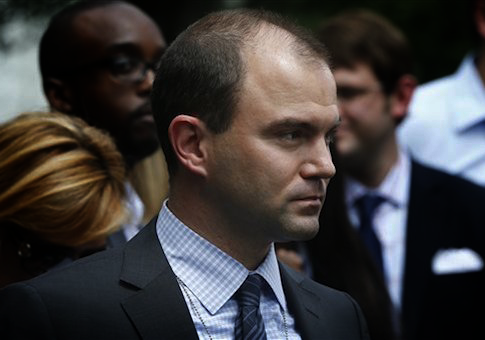 Obama’s closest advisers always understood him to be eager to do a deal with Iran as far back as 2012, and even since the beginning of his presidency. "It’s the center of the arc," Rhodes explained to me two days after the deal, officially known as the Joint Comprehensive Plan of Action, was implemented. He then checked off the ways in which the administration’s foreign-policy aims and priorities converged on Iran. "We don’t have to kind of be in cycles of conflict if we can find other ways to resolve these issues," he said. "We can do things that challenge the conventional thinking that, you know, ‘AIPAC doesn’t like this,’ or ‘the Israeli government doesn’t like this,’ or ‘the gulf countries don’t like it.’ It’s the possibility of improved relations with adversaries. It’s nonproliferation. So all these threads that the president’s been spinning — and I mean that not in the press sense — for almost a decade, they kind of all converged around Iran." In the narrative that Rhodes shaped, the "story" of the Iran deal began in 2013, when a "moderate" faction inside the Iranian regime led by Hassan Rouhani beat regime "hard-liners" in an election and then began to pursue a policy of "openness," which included a newfound willingness to negotiate the dismantling of its illicit nuclear-weapons program. The president set out the timeline himself in his speech announcing the nuclear deal on July 14, 2015: "Today, after two years of negotiations, the United States, together with our international partners, has achieved something that decades of animosity has not." While the president’s statement was technically accurate — there had in fact been two years of formal negotiations leading up to the signing of the JCPOA — it was also actively misleading, because the most meaningful part of the negotiations with Iran had begun in mid-2012, many months before Rouhani and the "moderate" camp were chosen in an election among candidates handpicked by Iran’s supreme leader, the Ayatollah Ali Khamenei. The idea that there was a new reality in Iran was politically useful to the Obama administration. 6) Rhodes doesn't care for Hillary Clinton, grouping her in with "The Blob" of "morons" and American foreign policy "establishment" figures. He also doesn't like people who "whine" about security lapses abroad. He had also developed a healthy contempt for the American foreign-policy establishment, including editors and reporters at The New York Times, The Washington Post, The New Yorker and elsewhere, who at first applauded the Iraq war and then sought to pin all the blame on Bush and his merry band of neocons when it quickly turned sour. If anything, that anger has grown fiercer during Rhodes’s time in the White House. He referred to the American foreign-policy establishment as the Blob. According to Rhodes, the Blob includes Hillary Clinton, Robert Gates and other Iraq-war promoters from both parties who now whine incessantly about the collapse of the American security order in Europe and the Middle East. 7) Leon Panetta would "probably not" say that Obama is still serious about stopping Iran from getting a nuclear weapon. As secretary of defense, he tells me, one of his most important jobs was keeping Prime Minister Benjamin Netanyahu of Israel and his defense minister, Ehud Barak, from launching a pre-emptive attack on Iran’s nuclear facilities. "They were both interested in the answer to the question, ‘Is the president serious?’ " Panetta recalls. "And you know my view, talking with the president, was: If brought to the point where we had evidence that they’re developing an atomic weapon, I think the president is serious that he is not going to allow that to happen." "But would you make that same assessment now?" I ask him. "Would I make that same assessment now?" he asks. "Probably not." "There were staff people who put themselves in a position where they kind of assumed where the president’s head was on a particular issue, and they thought their job was not to go through this open process of having people present all these different options, but to try to force the process to where they thought the president wanted to be," he says. "They’d say, ‘Well, this is where we want you to come out.’ And I’d say ‘[expletive], that’s not the way it works. We’ll present a plan, and then the president can make a decision.’ I mean, Jesus Christ, it is the president of the United States, you’re making some big decisions here, he ought to be entitled to hear all of those viewpoints and not to be driven down a certain path." This entry was posted in National Security and tagged Barack Obama, Ben Rhodes, Hillary Clinton, Iran, Iran Nuclear Deal, Leon Panetta. Bookmark the permalink.